Slip-though neck scarf fashioned from Pendleton blankets. Warm and cozy for those chilly days. Edges bound with soft durable suede cloth. 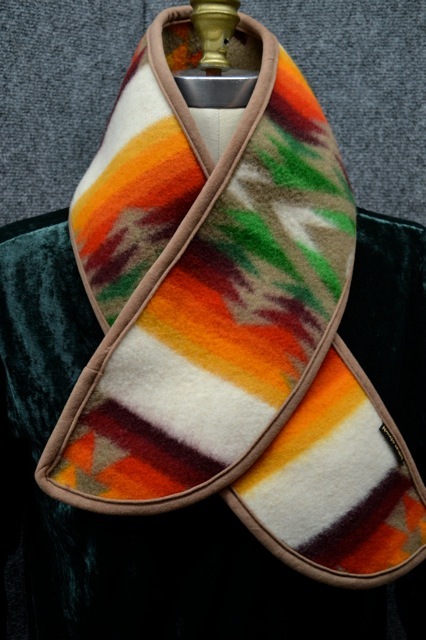 Wear it cinched up close to neck by pulling en..
Slip-though neck scarf fashioned from Pendleton blankets. Warm and cozy for those chilly days. Edges bound with soft durable suede cloth. Wear it cinched up close to neck by pulling end thru slit, or fold over under your jacket. Sign up for our newsletter below. You will be kept up to date on early sales, of inspiring fashions. © 2019 NavajoSpirit.com. All Rights Reserved.